At TREEPRO, we’re passionate about trees; their beauty, their health, and their proper care. We are Toronto arborists specializing in tree removal, tree pruning and stump grinding. Our services also include hedge trimming, shrub planting, lot clearing and arborist reports. 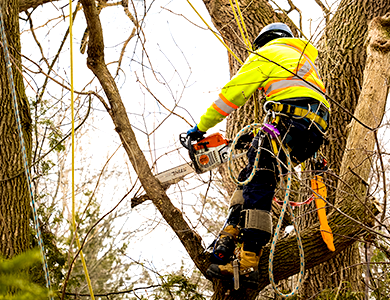 We provide arborist services to the Toronto and GTA area. TREEPRO provides swift, expert and courteous service. No job is completed until our customers are satisfied. Our arborists are fully trained and certified in their craft. In the unlikely event that something does go wrong, you’re fully protected. We use only the latest technology equipment, conforming to new emission and noise standards, to minimize inconvenience to you and your neighbours. Keep your property beautiful and safe! TREEPRO provides a complimentary tree assessment, risk analysis and esthetic recommendation in Toronto and the Greater Toronto Area. Regular maintenance, as tree pruning and tree trimming, for safety, health or aesthetic purposes. When a tree has to be removed, we’ll handle it quickly, safely and efficiently, with the minimum inconvenience possible to you and your neighbours. Our specialized equipment efficiently removes any size stumps without destroying your lawn. Hedge and shrub trimming services for health and esthethics. TREEPRO will consult with you on your trees’ health, and recommend the action required to ensure their optimal health. In case of emergency, we are available 24/7 for immediate response. At TREEPRO, we’re passionate about trees; their beauty, their health, and their proper care. We are Toronto arborists specializing in tree removal, tree pruning and stump grinding. Our services also include hedge trimming, shrub planting, lot clearing and arborist reports. Knowledgeable staff to carry out safe and efficient arbor practices for trees big and small. TREEPRO has been providing arborist services, within the Toronto area, for many years. We live and work in Toronto, and we know it well. Across the scope of our experience, we’ve seen a wide spectrum of situations, and brought safety and beautification solutions to many clients. All our arborists professionals are fully-licensed and qualified, additionally we are fully-insured and have active W.S.I.B. coverage for your full protection. Our TREEPRO arborists provide expert tree services to clients who expect nothing but the best. We use state-of-the-art equipement and abide to strict safety standards for optimal customer service quality and environmental sensibility. Our customers speak highly of us. We look forward to working with you. "TreePro provided fast, efficient service for the removal of an unruly pine tree on my front yard. Their representatives were pleasant and professional. The job was done on time and on budget. I would recommend this company." "Jamie came within hours of my telephone call and provided a much more reasonable estimate than competitors. He and his crew arrived sooner than he had promised and they felled and disposed of three dead trees on our residential property in a swift and efficient manner, leaving no trace or damage behind them. Jamie was highly professional, polite and pleasant to do business with." "Nervous that one large dead oak might fall on my residence, I called Jamie of TreePro and he came the same day to give me an estimate, which was much more reasonable than other companies. He came back within a few days and he and his crew felled three trees, sawed them up and turned the branches into wood chips, leaving hardly a trace and sparing surrounding trees. A very efficient job and Jamie was courteous, cooperative and very pleasant to deal with." Our skilled experts offer the best and safest tree trimming services in Toronto and the GTA so that your trees look beautiful and maintain optimal health. Expertly shaped trees will add to your yard's appeal and help the tree get access to more sunlight. Prolonge the life of your tree, as well as healthy growth and strength. Remove hazardous growth and risks of accidents. A tree with broken branches can pose a serious hazard to your family, your house, and your neighhbours. Us at TREEPRO take safety very seriously. Thinning out branches, diseased and dead limbs will ensure a safe environment for everyone. Rotting damaged, infested, and diseased trees may be beyond preservation and require removal. Tree removals require careful dismantling by highly trained personnel utilizing state-of-the-art machinery to ensure the protection and safety of your home and property. Stump grinding after removal can also be done by our TREEPRO experts for greater esthetic appeal. Regardless of the size of your tree, TREEPRO’s certified arborists will ensure that it is safely removed, and without damage to surrounding property features. Our fast and friendly service allows us to neatly clean up all of the mess associated with the tree removal. Tree stumps left behind after a tree has been removed can be unsightly. Removing tree stumps can be beneficial in more than one way as they can become breeding grounds for pests and infections. A lot of times the stump also bares sprouts of unhealthy new growth every spring. Our experienced crew and specialized hedge trimming tools will make get the job done quick and exactly how you want it. Our TREEPRO arborist experts follow proper shrub trimming techniques to achieve the most aesthetically pleasing and beneficial results. The structural integrity of a tree, and the amount of deadwood, or rot, that is in the tree and might be affecting its safety. Whether any fungus, decay, or pervasive insects are threatening the tree’s health. Trunk splitting, or any dangerous lean of either the tree, or particular limbs – and we’ll determine whether the situation is one in which cabling might be a corrective option!